A few months ago I was asked to see if I could arrange a London visit by this great ballet company from Russia and am delighted to announce that the Mikhailovsky ballet visit the UK for the first time between 22 - 27 July 2008 at The London Coliseum. To advertise in the programme and all press + publicity enquiries + press photos contact my office. From St Petersburg in Russia the Mikhailovsky Ballet make their debut appearance in Britain premiering a spectacular new production of the epic Spartacus. They also perform the romantic era ballet Giselle and a Triple Bill with a classic, unseen in Britain,Halte de Cavalerie with the flamboyant Paquita and Divertissements. This is a thrilling London showcase for this exciting company renowned in Russia for its high quality performers and productions and in Britain for one week only. The company visit the London Coliseum July 22- 27 2008. Choreographed in 2008 by George Kovtun,Spartacus has over 200 artists on stage. Costing over £1,775,000 this is the most extravagant dance spectacular on offer in the capital. With virile male dancers, acrobatic lifts an opera chorus and actors it stars world famous ballet dancer Denis Matvyenko as Spartacus. The Romantic era ballet Giselle staring Anastasia Matvienko or Irina Perren, in the title role. Both are renowned for their dramatic and balletic interpretation. Halte de Cavalerie - The Cavalry Halt - a gem by classic master choreographer Marius Petipa (1818 -1910) not seen in Britain before and his ebullient classic ballet Paquita with its colourful and thrilling dances and a selection of exciting Divertissements. London Coliseum 8 St Martins Lane London WC2N 4ES . Founded in 1833 and named after Grand Duke Mikhail, brother of Tsar Nicholas 1st, the Mikhailovsky Theatre is renowned for its ballet, opera and theatre productions. During its history the theatre has also been called the Maly Theatre with the famous Maly ballet being founded in 1933. In 1989 the Maly was again renamed, this time after the Russian composer Modest Moussorgsky. In 2007 the theatre got its original name back â€“ the Mikhailovsky Theatre â€“ and it celebrates its 175 anniversary in November 2008. 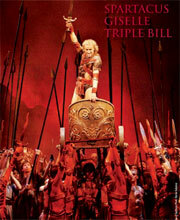 · Giselle is a ballet from the Romantic Era renowned for fine dancing and a challenging title role for the ballerina. Choreographed in 1841 by Jean Coralli and Jules Perrot and later arranged by Marius Petipa with music by Adolphe Adam. · Le Halte de Cavalerie - the Cavalry Halt dating from 1896 and thought to be unseen in Britain is a gem by the master of nineteenth century classical ballet Marius Petipa to music by Ivan Armsheimer. · Paquita is an exuberant and flamboyant display of dancing with a Spanish theme showcasing the virtuoso dancing by the company. Choreographed in 1846 by Joseph Mazilier it was restaged by Petipa in 1881 to music by Leon Minkus. · Divertissements from the ballets, especially selected for this first ever UK visit, include the astounding Spring Waters to music by Rachmaninov choreographed by Asaf Messerer staged by his nephew the British based Mikhail Messerer and Ocean and Pearls by Alexander Gorsky. Artistic Director of the Mikhailovsky Ballet is Farukh Ruzimatov known to British audiences for his outstanding performances at the London Coliseum with the Mariinsky (Kirov) Ballet. General Director of the Mikhailovsky Theatre is Russian businessman and great patron of the arts Vladimir Kekhman. The restoration of the theatre cost over $25 million. The ballet company are visiting with their full orchestra of 80 Spartacus will be conducted by Mr Karen Durgaryan and Elena Obraztsova directs the Mikhailovsky Opera. All Spartacus performances will be conducted by Karen Durgaryan.